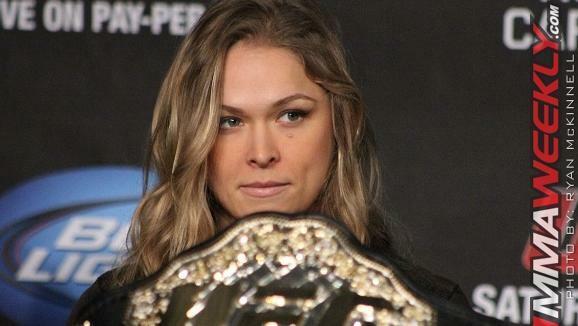 UFC women’s bantamweight champion Ronda Rousey is a polarizing figure. You either love her or hate her. But either way, she’s doesn’t give a damn. There are stars and there are superstars. Every now and then an athlete emerges that changes the landscape and image of a sport. And some athletes transcend their chosen sport and become cultural icons. In sixteen months and after four fights since being crowned the inaugural female UFC titleholder, Rousey has skyrocketed from former Olympic Judo medalist turned mixed martial artist into an ESPY award winning Hollywood sensation. “Everybody talks about how I’m always Ronda this and Ronda that. It’s hard not to be Ronda this and Ronda that when you deal with her,” White added. Rousey’s drive and work ethic separates her from most. Her attitude, looks and ability to captivate an audience whether in the cage or in interviews makes her unique. She’s a workaholic and perfectionist and it has paid dividends inside and outside of the Octagon. “Look at the attention she gets. We have her doing all this crazy (expletive). She’s going to China in a couple of weeks. She just hand knee surgery, and she’s got her hand casted. She’s going to China with me. She’s got to go down to Brazil and do a bunch of stuff in Brazil. The girl never stops. She’s got to promote all of her movies and do all of that stuff. It’s unbelievable,” said the UFC president. On Wednesday, Rousey became the first mixed martial artist to win an ESPY award. She took home the honors of Best Female Athlete. However, she did not attend the award show so she could heal from knee surgery and a broken hand.